Micro Link Extensions are also known as Micro Loop and Micro Bead Extensions. 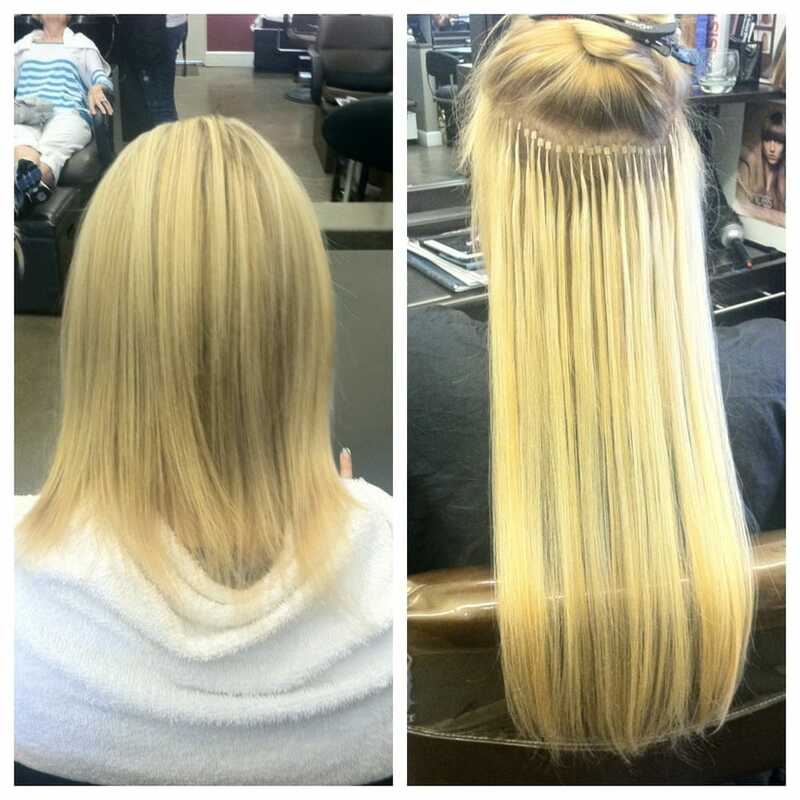 Micro Link Extensions are individual hair extensions applied strand by strand. They have metallic loops already attached to them and essentially are applied by pulling a section of hair, typically 1 cm wide, through the loop and clamping it down with a pliers to secure. Micro Link Extensions are most suitable for thicker and stronger hair. For best results, use 100% human remy hair. APPLYING MICRO LINK EXTENSIONS: The process of applying micro link extensions can take anywhere from 2 - 4 hours depending on how much hair your customer has but is totally worth it in the end. You’ll want to start by shampooing hair twice with a clarifying shampoo but DO NOT condition. Blow dry hair until it is completely free of moisture. In some cases, you may need to use a hot tool to straighten the hair. Create a clean section, about an inch from the nape of the neck and clip top section up. Create a small section of hair using your rat tail comb, usually about 1 cm wide. Take a strand of hair, place in through the plastic loop and pull the bottom of the plastic loop underneath the bead. This pulls hair through for you - then clamp it shut with a pliers. When applying leave about 1 finger space from the roots - too close and your customers scalp could be itchy and sore for a few days. If this happens, just undo bead with pliers and squeeze the opposite way, then re-apply. As you work your way up the head, use a “bricklay” pattern, filling in fullness considering the last section. Remember on the sides as you make your section, leave 2 finger spaces between the first extension and the hairline so the extensions do not show. Your eyes are your most valuable tool - use them as you are placing the extensions. The natural hair should always cover the extensions so they are not visible. HOME CARE: Let your customer know that their hair will feel heavier and they may cause a headache at first because of the weight, but she’ll get used to it. Educate your customer on how to care for her extensions. Use a shampoo that does not contain sulfates or parabens - these will weaken the bond. Washing too often will dry them out. Encourage the use of dry shampoos or conditioning treatments. Advise wrapping hair up at night. Styling at home with Micro Link Extensions is fun and easy since you can style them as if they are your own hair. The only damage caused by extensions is a result of not maintaining the extensions properly. All you’ll need for removal is a pair of plyers. Maintenance should be every 2-4 months, so be sure and pre-book a follow up appointment.